Throughout the year our bakery cafés update their menus to capture the flavors of the season. This spring we are trying out some new dishes that we hope you will enjoy. Brand new to our Madison and Wallingford cafés are Essential Breads & Spreads, mouth-watering appetizers paired with our organic artisan breads. 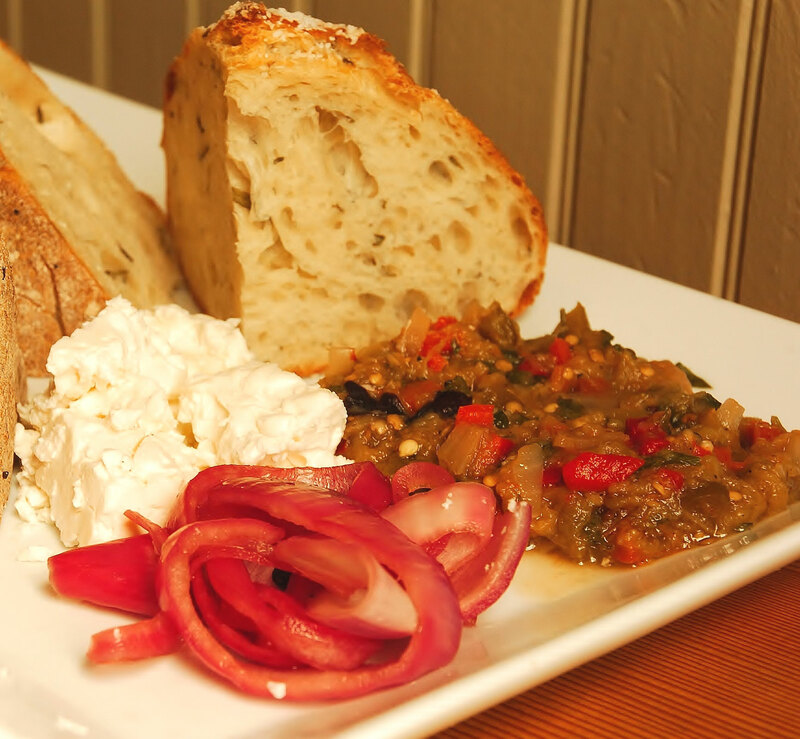 The Moroccan Eggplant Relish & Feta sends your taste buds on an eastern voyage where roasted eggplant, red onion and bell peppers melt together with cilantro, parsley, cumin, coriander and cayenne pepper. Rings of pickled red onions and generous hunks of Rosemary Diamante make this an exotic and satisfying light meal. The other combinations include Walnut bread with hummus, olive tapenade and cucumber and Olive bread with prosciutto, asparagus and chèvre drizzled with honey. Kale is the newest “it” vegetable, earning lots of buzz for being an amazing source of vitamins C and A. This hearty, leafy green shows up on our menu in some likely and not-so-likely places. The Raw Chopped Kale Salad is a vegan delight, piled high with shredded carrot and radish, cucumber, peas, garbanzo beans, sunflower seeds and pumpkin seeds. The accompanying tahini dressing is rich with flavor from sesame seeds, lemon juice, ginger and cayenne pepper. We’ve also given our classic Reuben a makeover by replacing pickled cabbage with our own kaleslaw and pickles and using a Dijon-mayonnaise spread instead of the traditional Russian dressing. We still serve the Reuben on our Rye bread with Gruyère cheese, and you can choose from pastrami, roasted turkey or portobella for the protein. 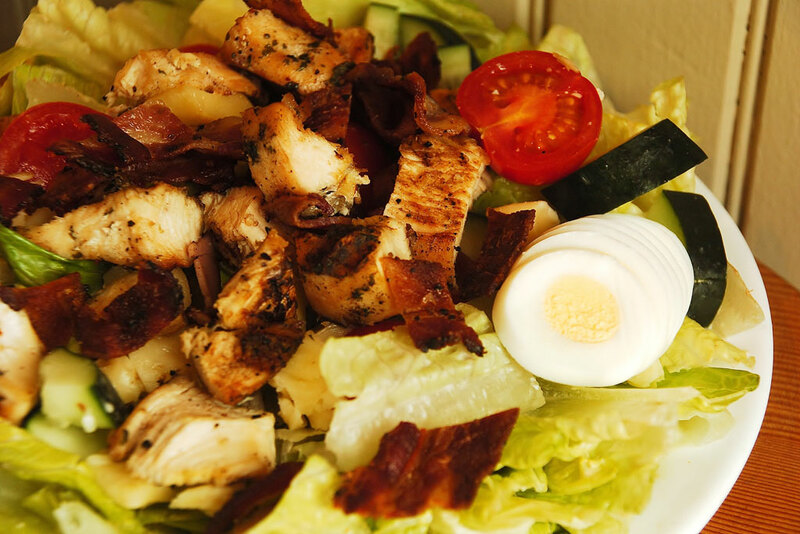 Another notable salad is the Roasted Chicken Cobb, a bed of vibrant Romaine lettuce topped with house-roasted chicken, peppered bacon, chunks of white cheddar, a sliced hard-boiled egg, tomato and cucumber. The Cobb comes with our creamy, herbed green goddess dressing prepared with chives, parsley, tarragon, scallions and garlic. 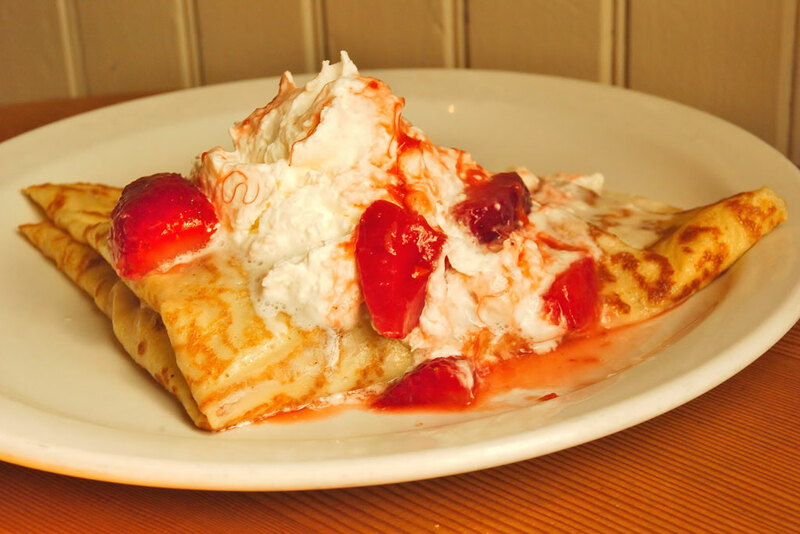 For dessert, or really any time of day, try the Strawberry Rhubarb Crêpe filled with a compote of rhubarb chunks and strawberries spiced with cinnamon, ginger and orange zest. On top of the crêpe sits a small mountain of fresh whipped cream drizzled with compote. We’ve also updated our Essential Bread Salad with flavors from Greece. Cubes of toasted Rosemary bread are tossed with arugula and mixed greens, tomato, cucumber, olives, feta and toasted almonds, with house-made balsamic vinaigrette. And for the vegans, we added two sandwiches. The Mediterranean Roasted Vegetable features eggplant, zucchini and bell peppers with pickled red onion, arugula and our own roasted tomato spread on Rosemary bread. Our Fremont Veggie is a step above the typical hummus and fresh vegetable sandwich with the addition of our kaleslaw and asparagus. Get your appetite going and download the menus for Madison, Wallingford and Georgetown to plan your next visit. And let us know what you think about your next meal.